Perhaps the greatest two-way backfield performer in the history of Hurricane football. 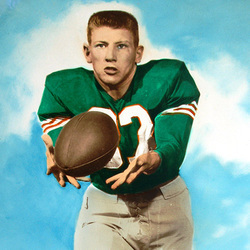 Buckner, Illinois native Whitey Rouviere left his mark on the Miami record books and in the mind of UM opponents for four thrilling seasons from 1952-1955. Described by Hurricane head coach Andy Gustafson as "the Best Halfback in America", prior to his Co-Captain senior season in '55, Coach Gustafson also praised his prized performer by adding "I don't know of a better man for single platoon football in the country than Whitey Rouviere"
He finished the 1954 season the co-national leader in interceptions. His UM record for most interceptions in a season held for 25 years, also most interceptions in a career held for 26 years. The picture of versatility, Whitey did it all for Miami on offense, defense and the special teams. His career rushing figures include 939 yards on 206 attempts for ten TD's and a sparkling 4.3 career average. He also caught 22 passes for 284 yards. On ten career punts returns, he averaged a remarkable 20.0 yards per attempt, while also collecting 113 yards on 13 kickoff returns. Forever remembered as one of Miami's all-time great "sixty-minute men", Rouviere's 1954, 1955 seasons gained him AP and UPI All American Honorable Mention. To add to his 4 year football career, Whitey played 3 years of Baseball, 1 year of Track, 1 year of Basketball--earning him 8 varsity letters in his UM career.